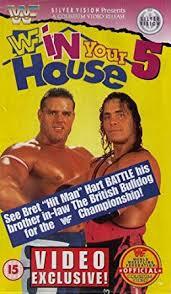 In Your House 5 (retroactively titled In Your House 5: Seasons Beatings) was the fifth In Your House professional wrestling pay-per-view (PPV) event produced by the World Wrestling Federation (WWF), which took place on December 17, 1995, at the Hersheypark Arena in Hershey, Pennsylvania. Six matches aired as part of the PPV broadcast and three additional matches were held only seen by the people in attendance on the night. With the launch of the WWE Network in 2014 this show became available on demand, but does not include the three dark matches held before and after the main show. The main event was a rematch from the 1992 SummerSlam show as WWF World Heavyweight Champion Bret Hart defended the championship against his brother-in-law The British Bulldog. On the undercard the Undertaker faced off against King Mabel in a Casket match. Another match on the show could only end when either Hunter Hearst Helmsley or Henry O. Godwinn was thrown into a hog pen that was erected in the arena. In Your House 5 featured professional wrestling matches involving different wrestlers from pre-existing scripted feuds, plots, and storylines that were played out on Monday Night Raw and other World Wrestling Federation (WWF) television programs. Wrestlers portrayed a villain or a hero as they followed a series of events that built tension, and culminated into a wrestling match or series of matches. Following the first match on the broadcast, Jerry Lawler introduced the returning Jeff Jarrett and presented him with a storyline gold record for supposedly selling 500,000 copies of his country music album, Ain't I Great. Lawler then invited Jarrett to do commentary with himself and Vince McMahon for the next match. In the second match Ahmed Johnson was originally supposed to face Dean Douglas, but Douglas claimed that he could not compete due to a back injury. He introduced Buddy Landel (his "graduate student") as his replacement for the night. Johnson won the match, and afterward Jarrett attacked Johnson with his gold record. ^ a b c d e f g h i j "Historical Cards: In Your House 5 (December 12, 1995. Hershey, Pennsylvania)". PWI Presents: 2007 Wrestling Almanak and book of facts. Kappa Publications. p. 150. 2007 Edition. ^ a b c d e f g h i j "In Your House #5". Pro Wrestling History. December 17, 1995. ^ a b c d e f g h i j Cawthon, Graham (2013). the History of Professional Wrestling: WWF 1990 - 1999. CreateSpace Independent Publishing Platform. ASIN B00RWUNSRS. ^ "WWF In Your House 5: Season's Beatings". The Internet Wrestling Database. Retrieved February 8, 2016. ^ "Live & Televised Entertainment of World Wrestling Entertainment". World Wrestling Entertainment. Archived from the original on 2013-11-18. Retrieved 2010-04-24. This page was last edited on 22 April 2019, at 20:48 (UTC).